I got out of the house for the first time since Lil'Pipomixes arrived last Friday to attend Flavor's 90's Night. I was pleasantly surprised to see that they were selling 90's themed mixes from both J. Rocc and DJ Spinna. 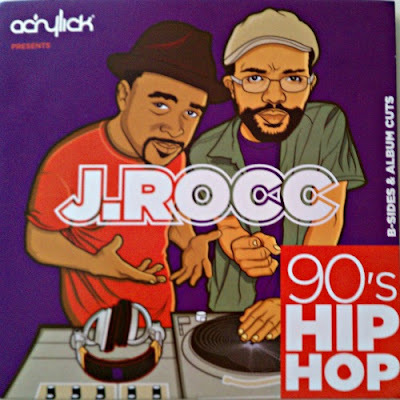 J. Rocc's mix focuses on b-sides and album cuts from the 90's while Spinna's mix (it will post soon) focuses on RnB from the 90's. I think I was one of like three people who actually bought the J. Rocc and Spinna mixes being sold at the event. I don't know if all the heads there just didn't know the time, or whether they knew they'd eventually get the mixes here. In any event, here you all go. Enjoy. really strong mix. thanks for posting it! anyone know what the track is ~18:45. the one with the lyric, "i'm a mack like will hutch"? Lyrical Prophets Strictly Dope "Back Atcha"
Tom Scott "Sneakin' in the Back"
Thank you pipo for this exclusive mix again, really wait for the spinna one. Thanks for the reply, Eric. Nice track for sure. Dope! And congrats on Pipo Jr!